This article engages historically and ethnographically the idea and idiom of the prototypical Naga ‘village republic.’ Even as the popular imagination of Naga villages as ‘republics’ traces back to colonial writings, and while much has changed since, I illustrate the remarkable resilience of the ‘Naga village’ as a political, partisan, self-protective and affective unit. I perceive the Naga village as encompassing a moral community characterized by its temporal and spatial rootedness, and whose inhabitants define themselves through the conduit of historical memory – a nexus locally between history, locality, ancestral genealogy, and identity – and which orients their relations with neighbouring and nearby villages and villagers. More specifically, I discuss the contemporary form and substance of the ‘Naga village’ in relation to (1) identity and identification, (2) local governance, particularly Nagaland’s policy of communitisation, and (3) democracy and elections. Butler, J. 1855. Travels and adventures in the province of Assam, 1855. In Nagas in the Nineteenth Century (ed) V. Elwin (1969), 594-97. Bombay: Oxford University Press. Devi, L. 1968. Ahom-tribal relations: A political study. Gauhati: Cotton College. Elwin, V. 1961. Nagaland. Shillong: The Research Department Secretariat. Evans-Pritchard, E.E. 1940. The Nuer of the Southern Sudan. In African political systems (eds) M. Fortes & E.E. Evans-Pritchard. London: Oxford University Press. Fuller, C.F. & J. Spencer 1990. 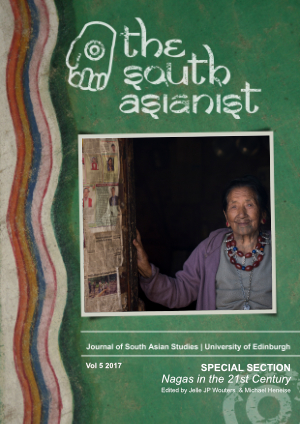 South Asian Anthropology in the 1980s. In South Asia Research 10, 85-105. Fürer-Haimendorf, C. von. 1973. Social and cultural change among the Konyak Naga. Highlander 1, 3-12. _____ 1939. The naked Nagas. London: Methuen & Company. Gupta, D. 2005. Wither the Indian village. In Economic and Political Weekly 40, 751-758. Horam, M. 1992 . Naga polity. Delhi: D.K. Fine Art Press. Hutton, J.H. 1987. Chang language, grammar, and vocabulary of the language of the Chang Naga tribe. New Delhi: Gian Publishing House. _____ 1965. The mixed culture of the Naga tribes. In Journal of the Royal Anthropological Institute of Great Britain and Ireland 95, 16-43. _____ 1929. Diaries of two tours in the unadministered area East of the Naga Hills. Calcutta: Asiatic Society of Bengal. _____ 1921a The Angami Nagas: with some notes on neighbouring tribes. London: Macmillan. _____ 1921b. The Sema Nagas. London: Macmillan. Mills, J.P. 1926. The Ao Nagas. London: Macmillan. Mines, D. & N. Yazgi. 2010. Introduction: Do villages matter?. In Village matters: relocating villages in the contemporary anthropology of India (eds) D. Mines & N. Yazgi. Delhi: Oxford University Press. Mofatt-Mills, A.J. 1854. Report on the Province of Assam. In Nagas in the Nineteenth Century (ed) V. Elwin (1969). Bombay: Oxford University Press. Pandey, R.S. 2010. Communitisation: third way of governance. New Delhi: Concept Publishing Company. Pongener, M. 2011. Morung Speaks: cultural vaues and elements for the enrichment of Naga Christian Community. Jorhat: TDCC. Singh, C. 2004. Nagaland politics: a critical account. New Delhi: Mittal Publications. Smith, W.C. 1925. The Ao Naga tribe of Assam: A study in ethnology and sociology. London: MacMillan & Co.
Thorat, S.P.P. 1986. From reveille to retreat. New Delhi: Allied Publishers. Wouters, J.J.P. 2017. The making of tribes: the Chang and Chakhesang Nagas in India’s Northeast. In Contributions to Indian Sociology 51, 79-104. _____ 2015b. Polythetic democracy: Tribal elections, bogus votes, and the political imagination in the Naga uplands of Northeast India. In HAU: Journal of Ethnographic Theory 5, 121-151. _____ 2014. Performing democracy in Nagaland: Past polities and present politics. In Economic and Political Weekly 49, 59-66. _____2011. Keeping the hill tribes at bay: A critique from India’s Northeast of James C. Scott’s paradigm of state evasion. In European Bulletin of Himalayan Research 39, 41-65.